DJ Kenny in action on his Green Bush radio show. 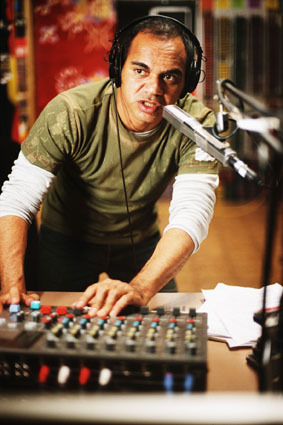 Every night, Indigenous DJ Kenny hosts the Green Bush show for Aboriginal inmates and their families. Isolated at the station, he takes requests from those on the inside and out while at the same time coping with the results of a wild night outside and learning his place in the circle of violence. Green Bush is based on Warwick Thornton's real-life experience as a DJ in Alice Springs and celebrates an era of music, working for the cause and getting things done. But not in the way you would expect. A collection of Aboriginal music recorded in Alice Springs by CAAMA Music during the eighties and nineties. Green Bush is part of the Dramatically Black series (an initiative of the Indigenous Unit of the AFC and SBS Independent). Warwick Thornton recalls what led to Green Bush: "Where I grew up in Alice I was a DJ for a radio station. The station began a film unit and so I watched people pack cameras and equipment into cars and take off to make films. I was alone at the radio station and I thought that I really wanted to go with them. That's how it started, I made a film called Green Bush which is basically about that time." Green Bush marks Bangarra Dance Theatre's David Page film acting debut in a leading role. The movie was filmed around Alice Springs, NT.